There is a lot of information on the net about drip irrigation systems. Many of the sites with detailed instructions seem to be focused on farm type setups. I want to share the development of a system for my small home garden. The information that follows is for the benefit of home gardeners, especially for folks growing edible gardens. I’ve been using drip in my home garden for years but it’s been sort if willy-nilly. We add some new plants – I add some new drip lines. Lately I’ve had time to spend on a more detailed and careful approach to gardening with an eye toward sustainability, food production and, now especially, water conservation. I am rebuilding my drip system based on the the latest technology and irrigation methods. The layout of the system is designed around the location of the plants, not the other way around. I have a small area for growing a garden and the plants get placed to utilize available sunlight and space as efficiently as possible. The image below shows the components of one of my zone controllers. A “zone” is irrigation jargon for a water valve and the stuff connected to it including the plants it will irrigate. There are many other possible configurations but this is one is straight forward and allows for easy maintenance and expansion. Since it is designed for use over many years, it is permanently connected to the water supply. A couple of the zones in my system were originally for lawn sprinklers — before I got rid of the front and back lawns. Here is a list of the components with a description of each. The “brains’ of the system. The timer provides automatic scheduling of irrigation and allows you to spend time away without worrying about your garden dying from lack of water. This is used to turn off the water to a zone valve or group of valves allowing for maintenance, and Winterization. Winterization basically involves draining water from the valves to prevent damage from winter freezes. I had installed metal gate valves in a previous iteration of the system but they began to leak after a couple of years and the plastic ball valve should not have this problem. This is a special piece of plumbing that connects the valve(s) to the water supply. It facilitates easy replacement of a valve when necessary, provides for easy expansion of the system, and in the case of multi valve manifolds, it allows closer spacing of valves than using conventional pipe fittings. The manifold has swivel connecters that allow for installation without using tools. The connectors on the manifold are 1” diameter pipe thread and require adapters for connecting them to the 3/4” valves. Controls the flow of water in its zone. 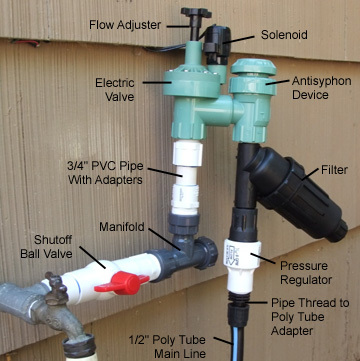 There are valves without the anti-syphon feature but building codes in many areas require it for home installations. 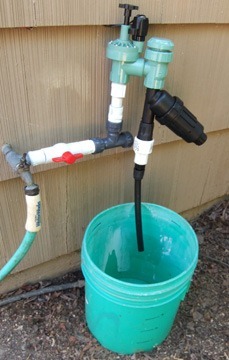 The anti-syphon device prevents water from the garden from backing up into your home’s drinking water. Valves are available with threaded connections or slip type connection that are glued in place. Threaded connections are recommended because they allow for valve replacement or modification of the system without destroying any of the parts. The solenoid is connected to the electronic timer for automatic operation. Eliminates particles from the water that could clog the emitters that deliver water to your plants. It is an important safe guard of your investment in the system and plants. For most home drip systems a 150 mesh filter is adequate. Lack of a filter will void the warranty of other system components. The filters I use have 3/4” pipe thread on both ends. this allows the filter to attach directly to the valve. Emitters, tubing, and fittings, in a drip system are designed to operate at relatively low pressure. The pressure regulator ensures that the water pressure in the system is at a safe level. It also helps eliminate fluctuations in pressure that can occur, for example, from water being turned on or off in other parts of your yard or home. Regulators are available with adjustable or pre-set operating pressures. Adjustable regulators are expensive and not necessary for home drip systems. Pre-set regulators are commonly available with pressures from 10 PSI to 40 PSI. A good choice for the home system is 20 PSI regulators. The regulator has 3/4” pipe threads and connects directly to the filter. This fitting allows you to connect the main line polyethylene tubing to the system. It has 3/4” pipe thread on one end that attaches to the pressure regulator and a locking type connector on the other. Locking connectors are fittings that have barb or boss that fits inside the tubing and a collar that twists over the outside of the tubing locking it in place. They can be easily taken apart and reused. Polyethylene (poly) tubing is used for the main distribution lines of the system. It is available in a few different diameters with 1/2 inch being the most common. Chose a tubing size you will use for all your zones and be sure the fittings you get are for the size of tubing you are using. This will allow tubing and fittings to be interchangeable throughout your system. Assembling the components is easy. I like to glue the PVC parts together a day before final assembly. This gives the glue a chance to fully set. I put 5-6 turns of Teflon pipe tape on the threaded portions of the components. and screw them together by hand. It took me about ten minutes to assemble the components shown in the picture above. After putting everything together, It’s time to test the flow rate. You will need a calibrated 5 gallon bucket and something you can use as a stop watch for this test. I picked up a digital stop watch at a sporting goods store for under $10.00. It also comes in handy for other irrigation related uses. I first calibrated a one gallon jug by carefully filling it with one gallon of water using a kitchen measuring cup and marked the one gallon water line with a sharpie. I then filled the 5 gallon bucket using the calibrated one gallon jug and marked the level of each gallon. After emptying the bucket I also marked the 5 gallon level on the inside of the bucket so it would be easy to see when water reached that level. Once you have the bucket calibrated you can use it for many tests. If you haven’t already done so, turn on the water at the shutoff valve and check for leaks. The flow rate in gallons per hour (GPH) lets you know how many drip emitters you can install in this zone. You just need to add up the GPH for all the emitters you plan to install or have already installed and that number should not exceed the GPH for this zone. We are now in the zone! Copyright © 2012. xperimentia.com. All rights reserved. Reblogged this on Sustainable USA .